Magnum Options promises no-risk and quick profits trading from home. Can they be trusted? Is Magnum Options scam or legitimate? Let’s find out in this review. 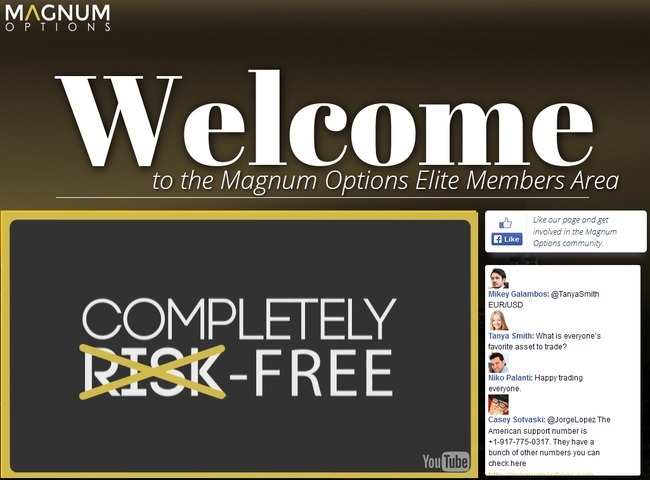 Magnum Options is a relatively new binary options broker that has just launched an aggressive marketing campaign. Magnum Options was founded in early 2014 by Bluesky Solutions Ltd, so it’s understandable that they want to market their broker as aggressively as possible. However, the problem lies in the way Magnum Options present their binary trading platform. Within their sales pitches, they are not telling you the truth about binary options trading. Instead, they present you with unrealistic promises and pure hype of quick riches. More on that below. To make sure everyone is on the same page, we’ll briefly explain how binary options work. Binary options is a form of trading that has been gaining popularity in recent years due to its simplicity. However, simplicity doesn’t mean it’s easy to profit from binary trading. Instead of reading charts and analyzing financial news, with binary options, you only predict if an asset’s price will rise or fall after a short amount of time, usually between 30 seconds to minutes. You either win, or you lose the bet. There are only 2 outcomes (hence the name binary options). Let’s say I predict that the price of gold will rise 5 minutes from now, and I bet $50 on it. If I’m right, I’ll win a certain percentage of what I bet. Magnum Options claims to offer up to 81% profit, but the real range will be closer to 60%-80%. So if I guess correctly, and gold’s price rises after my 5-minute contract expires, I’ll earn $40 on a 80% profit contract. However, if I’m wrong, I lose the entire sum that I bet. This makes binary options not that different from gambling. There’s no good way of timing the market in such a short period of time. Even if you manage a 50% win rate, you’ll still lose money due to the imbalanced winning vs losing payout. The sales video of Magnum Options isn’t telling you the whole truth of binary trading. Instead, they try to sugar coat binary trading by omitting the big risks that come with it. In the video, Magnum Options claims that you’ll earn big money trading with them, just by using a few minutes everyday from the comfort of home. All you need to do is to decide if the market will go up or down, and that’s it. You reap profits. What Magnum Options conveniently left out is the huge risks you impose on your own capital. They keep stressing that opening an account with Magnum Options is free, but you’ll need to deposit a sum of money before you start trading. You can watch the full sales clip of Magnum Options here. The truth is, every time you place a trade, you are exposing your capital to risks just like any other investments out there. However, unlike longer-term investments, you are just guessing the market’s movements within an extremely short period of time. You are essentially gambling your money away. Remember – whether you make or lose money, Magnum Options will profit from you through your trading activities. That’s how they earn money. And that’s why Magnum Options wants you to believe that binary options is your ticket to achieving financial freedom. But it is not. Even Forbes, the reputable financial website warns you against gambling on binary options. 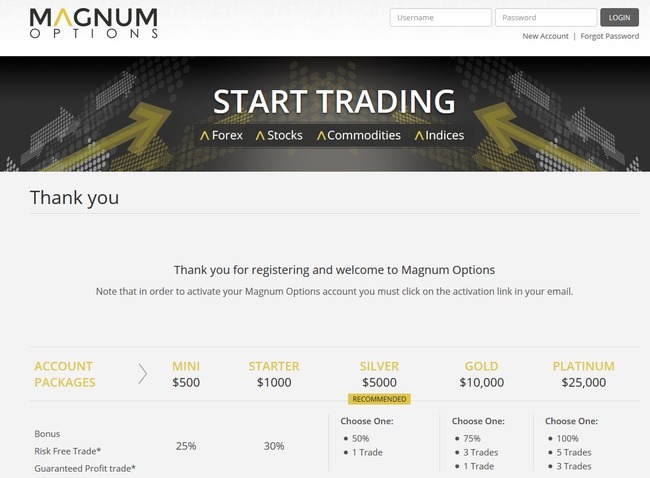 If you sign up with Magnum Options, you’ll need to deposit a sum of money into your account before you can start trading. Within the deposit page, you’ll be offered different account packages with various deposit amounts. The most basic package is the MINI package, which starts at $500. There are a lot of other packages, going all the way up to $25,000. However, after asking some questions to their support team, I found that the actual minimum investment with Magnum Options is only $200. This wasn’t written in the deposit page at all. Magnum Options tries to lure the first time users into believing that $500 is the absolute minimum investment amount. You have to talk to their support team or search their FAQ page to find out the real minimum deposit. As much as Magnum Options tries to sugar coat binary trading and their trading platform, they still have to put up a disclaimer in fine prints to comply with the regulations. 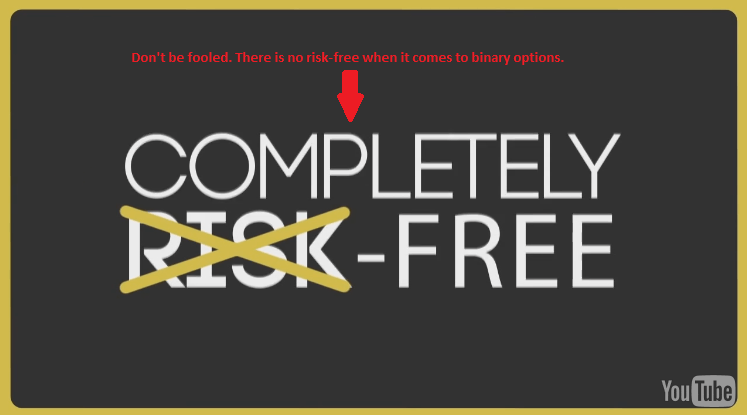 Hidden deep within the fine prints of their disclaimer, you’ll realize that even Magnum Options agrees that binary option trading involves a real risk of loss, even when they tell you it’s completely risk free in their sales video. You should also be prepared to lose all your funds which you have deposited for trading. And that is a very likely scenario, given the vast majority of binary traders who lose money. Should I Join Magnum Options? NO. Although I wouldn’t call Magnum Options a complete scam, it is undeniable that their sales materials try to mislead you, and make you think that you can make easy money with them without risks. The truth is, you are facing great risks, and the risks are all on you, not the broker. In a weak moment brought on by hard financial times and lack of work in our area, I fell for Magnum Options fraudulent video and put down the amount requested of $200. Their broker/trader Brenden Clifford? informed me that $200 was not enough and I needed much more money to trade with. He suggested I choose from three packages, the lowest being around $5000. I told him that nothing he said matched the video, and that it had completely misrepresented their product. He, in turn, rebuked me for taking their own promotional material at face value and basically told me no intelligent person would believe such a thing. The next day I sent him an email saying I was no longer interested in pursuing this kind of investing, that I had no reason to trust them, and that I wanted my money back. They assured me that they have put in a withdrawal request, but I have not seen it yet, and that was six days ago. They continue to send me what looks like bulletins and I can’t help but feel they are completely bogus. My credit card provider says they will dispute the payment, but I’d like to know what else I can do. Keep following up with them regarding the withdrawal. It’s good that you have disputed the payment, so for now you can only follow up on the broker to check on latest status. Thank you for this. This is the first set of information about Magnum and binary options I have read that gives a true explanation of the risk it involves and probabilities of losing or gaining. Before this I was about to fall for the hype. Thank you for bringing me back down to earth. So….back to the drawing board …..
Hey Sharon, glad the review helped you dodge a bullet! There’s no free lunch in the world, just remember that. Making money online requires effort just like any other jobs. You can take a look at Wealthy Affiliate if you need some guidance.